Bitcoin is quickly becoming a popular way to accept online payments. It is fast, digital, and cost effective. Due to the tremendous increase in the Bitcoin value, it has caught the attention of mainstream media. 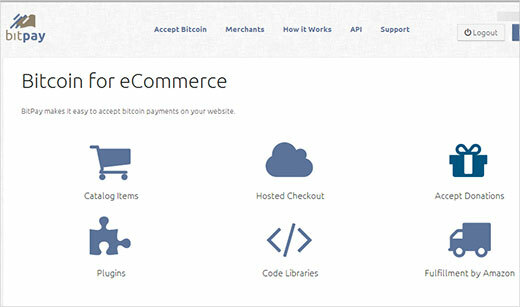 One of our users asked us how they can accept Bitcoin payments on their WordPress site. In this article, we will show you to add a Bitcoin donate button in WordPress using BitPay. This button could replace or go right next to your PayPal donate button offering your visitors an alternative way to make payments while saving you money on transactions. What is BitCoin and BitPay? BitCoin is a peer-to-peer, digital currency which was introduced as an Open Source software in 2009. It is completely digital, which means it is stored and exchanged online. However, it does not mean you can’t get it exchanged into paper currency of your choice. It is called peer-to-peer currency because there is no regulatory authority or bank involved in the currency exchange. At the time of writing this article, 1 Bitcoin valued $644 USD. 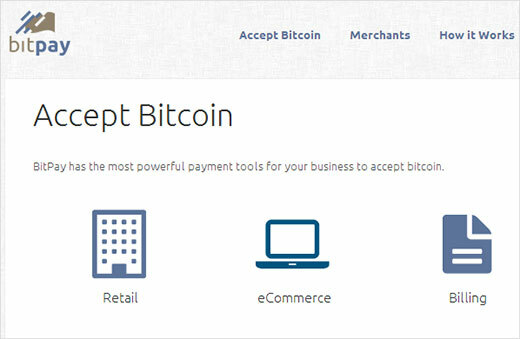 BitPay is an electronic payment processing system for the Bitcoin currency. It allows merchants to easily accept and process payments in Bitcoins. Think of Bitcoin as US dollar and Bitpay as Mastercard, Visa, or PayPal. When a users pays you in Bitcoins, you can get those Bitcoins into your wallet or get them exchanged in your local currency and transferred to your bank account. BitPay allows you to get your Bitcoin payments in your local currency. But if you would like to receive your payments in Bitcoins, then you will need a Wallet. A Bitcoin wallet is a software installed on your computer where you store your digital currency. There are a number of options available for desktop, mobile, and web services. We recommend using Blockchain.info which provides an easy web based app that works on any device. Once you have created your wallet, you will be able to receive payments in Bitcoins from Bitpay in your wallet. First thing you need to do is signup for a free account on BitPay. After the signup, your application will be reviewed and approved within a few hours. You will get an approval notification by email. Once approved, you need to visit the BitPay website again and set up your password along with other account details. On your BitPay dashboard, you need to click on Accept Bitcoins link from the top menu. It will open a page showing you different solutions, but you need to click on eCommerce. On the eCommerce payments screen, you will be shown a number of options. You need to click on Accept Donations button. The next screen will show you options to configure the donate button settings. The first option is to decide whether you would like the donors to enter the amount, or you want to use a fixed donation amount. If you choose ‘Donor Chosen Amount’, then your Bitcoin donate button will appear with a form that the donors will have to fill to donate. If you choose the fixed donation amount, then the donate button settings page will display additional fields. You can enter the fixed amount for the donations, choose currency, and add description. Under the payment notifications settings, you can enter the URL of a page on your WordPress site where users you will be redirected after they have made the payment. Usually this page is a thank you page that you can create in your WordPress. You can also add an email address where you would like to be notified when a user makes a donation. Once you are done setting up your Bitcoin donate button, you need to click on the Generate button. This will generate your Bitcoin donate button code with three button size choices. You can choose from a small, medium, or large button by clicking on it. After that you need to copy the displayed code and paste it in a text editor like Notepad because you will need this code in the next step. The code generated by BitPay is an HTML form and if you insert it in your blog post, there is a good chance that it will not be handled well by the WordPress post editor when it sanitizes the content. This is why you would need to create a shortcode to add the button in your posts, pages, or widgets. To do that simply copy and paste this code in your theme’s functions.php file or in a site-specific plugin. To display the donate button, all you need to do is add [bitpaydonate] shortcode in your post, pages, or widgets. That’s all. 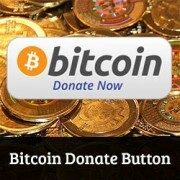 You can now receive Bitcoin donations. You can keep them as Bitcoins in your wallet, or get them converted into your local currency and deposited into your bank account using BitPay. If you are keeping your Bitcoins in your wallet, then make sure that you understand the risks and always backup your wallet. We hope this article helped you add a Bitcoin donate button on your WordPress site using BitPay. For questions and feedback, you can leave us a comment below. Let us know what do you think about Bitcoin and it’s future as a digital currency? Bitpay is completely different now, this article is out of date, seems impossible to create a bitcoin button without a plugin now. Very nicely shared about the difference between bitCoin and bitPay? Thanks for such an wonderful and interesting post. This doesn’t work as described bc you’re missing a step. By adding the php to your functions.php file and adding the shortcode to a page, the HTML created still hasn’t been placed anywhere on your site… It’s still sitting in your text editor. Can you please explain what we’re supposed to do with the generated HTML? Bitpay told me they are not licensed to allow entities that aren’t 501(c)3 non-profits to take donations. This is great. Thank you for the information. But can you allow people to donate an amount of their choosing? I tried but it doesn’t work.